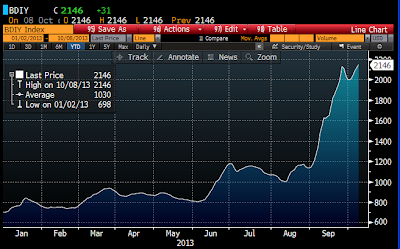 Bloomberg's index of financial conditions reached a new all-time high today. Swap, muni, agency and credit spreads are generally low, liquidity conditions are excellent, the yield curve is positively sloped, implied equity index volatility is relatively low, and yields on Treasuries and corporate bonds are relatively low. 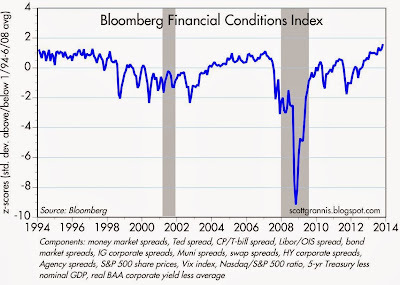 With financial market conditions are as positive as they are now, a near-term recession is highly unlikely. 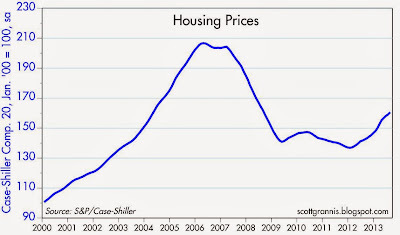 I note that this index turned down more than four months before the last recession, and years before the 2001 recession. It's old news by now, but today we learned that U.S. industrial production in September was stronger than expected (+0.6% vs. +0.4%), and registered a 3.2% increase year over year. That's decent, unspectacular growth which shows no sign of stagnating or declining. 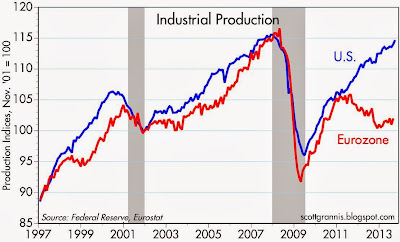 By now, it's very likely that the industrial side of the U.S. economy has fully recovered—after more than four years—to its pre-recession levels and is breaking new high ground. 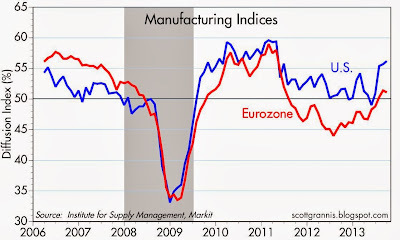 As the above chart shows, the Eurozone has fallen significantly behind the U.S., but appears to be firming of late. It's safe to say that the recent Eurozone recession is over and a modest recovery there is underway. A comparison of U.S. to Eurozone equities show just how significant the shortfall in Eurozone industrial production has been. The PIIGS sovereign debt crisis and its attendant uncertainties put a real dent in Eurozone GDP, and that in turn resulted in a Eurozone equities underperforming their U.S. counterparts by roughly one-third. 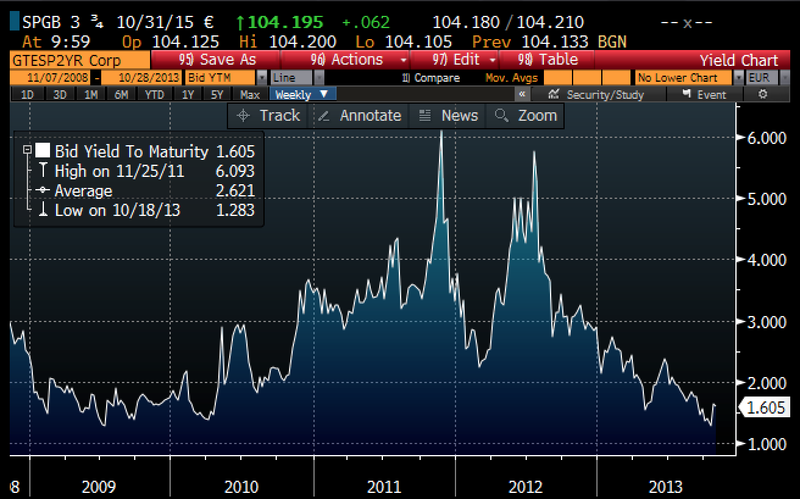 The chart above shows CDS spreads on Spanish 5-yr sovereign debt. 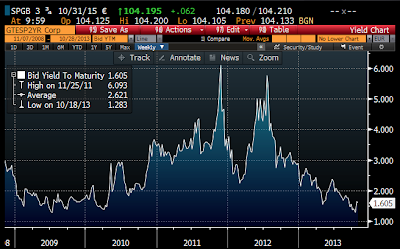 After peaking in 2012, spreads have plunged, reflecting a significant decline in Spain's default risk. Spreads have now returned to pre-PIIGS-crisis levels, a turnaround that is not widely appreciated. Eurozone equities bottomed around the same time that CDS spreads peaked, and have recovered significantly as spreads have dropped. This suggests that the recent rally in Eurozone equities has been driven by a substantial improvement in the fundamentals of the Eurozone economy: e.g., much less default risk, the end of the recession, and the gradual return of growth. 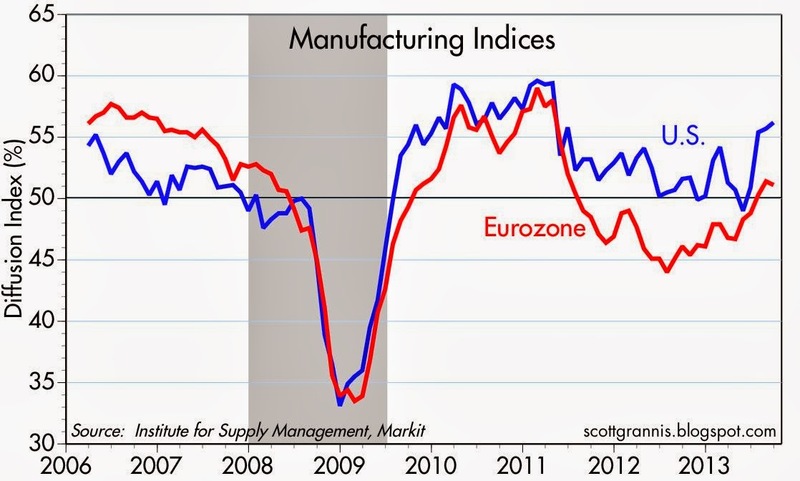 We have yet to see whether Eurozone growth can outpace that of the U.S. 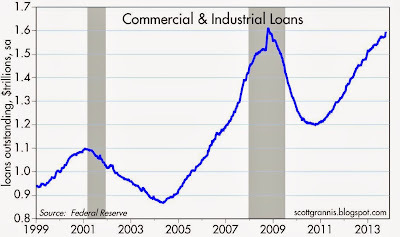 The above chart shows total outstanding Commercial & Industrial Loans (a proxy for bank lending to small and medium-sized business) over the past four months. 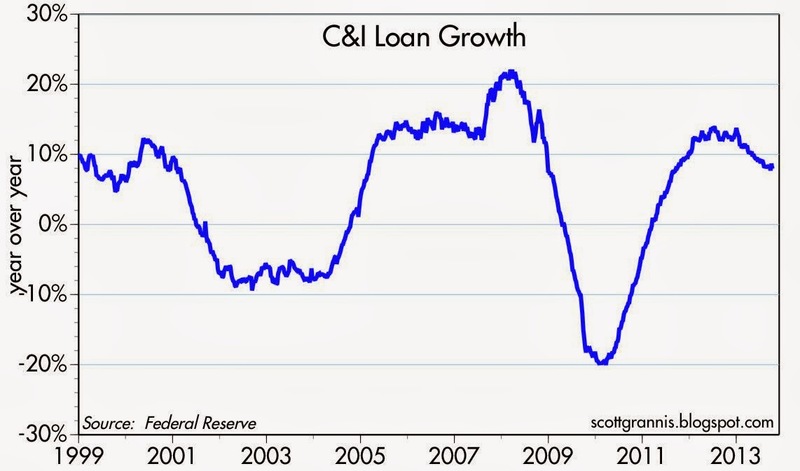 After being relatively stagnant for most of the summer, C&I Loans have grown 2% in the past three weeks, bringing their year over year growth rate to a respectable 8.8%. 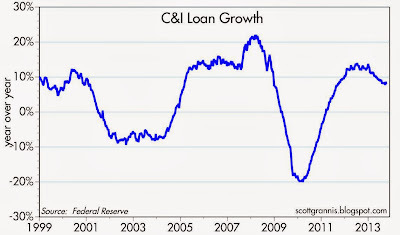 Since late 2010, C&I Loans have grown by fully one third, and are now very near their all-time high. The continued and relatively strong growth of bank lending to businesses is a good omen for the future, since it reflects increased confidence on the part of banks and businesses. Capital goods orders may be sluggish (see previous post), but there are still bright spots to be found in the private sector. 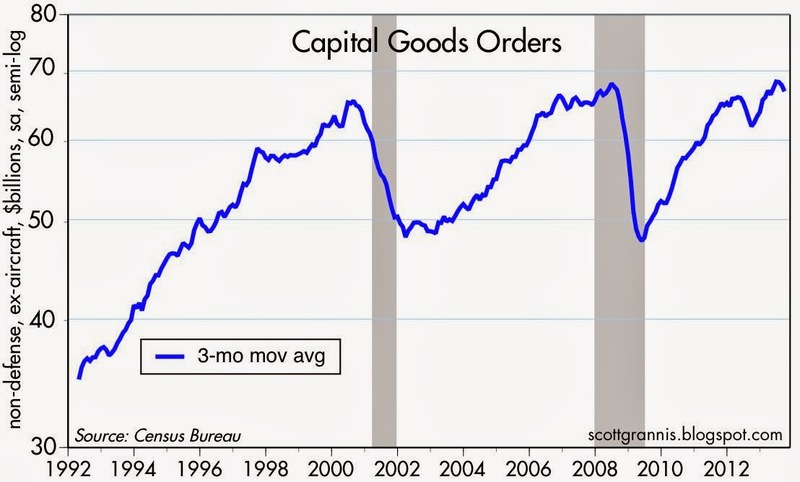 September capital goods orders were weaker than expected, and have been sluggish since the beginning of last year. This measure of business investment is hardly impressive, and reflects a chronic lack of confidence on the part of business. With corporate profits at all-time highs, but business investment in capital goods yet to surpass pre-recession levels, it's not hard to see why the economy has been growing slowly. Businesses could be doing a whole lot more, but for a variety of reasons—burdensome increases in regulations and higher taxes, to name just a few—they have been reluctant to invest in the future. The U.S. has the highest rate of corporate income tax in the developed world, the onset of Obamacare has placed additional and heavy burdens on small business, and Dodd-Frank regulations have added huge burdens to the financial industry. 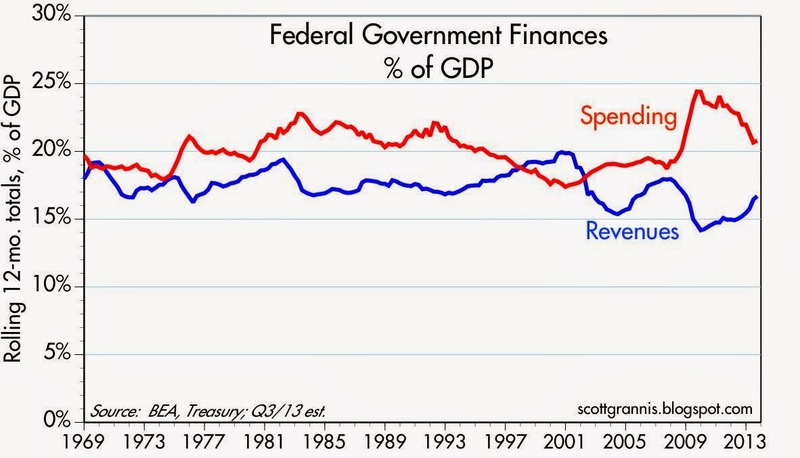 Government needs to get out of the way if the economy is to proceed at a faster pace. 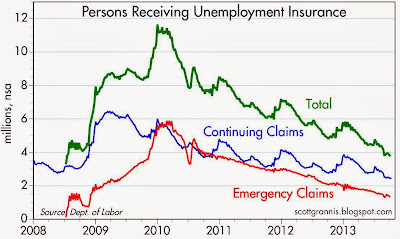 I've featured this chart many times in recent years, always commenting to the effect that the decline in the number of people receiving unemployment insurance benefits was good news for the economy since it increased the incentives of the unemployed to find and accept jobs. Recall that Congress in 2008 took the unprecedented step of creating "emergency unemployment benefits, which had the effect of significantly boosting the number and duration of people receiving benefits. Until the Great Recession, we had never seen such a high level of unemployed receiving benefits for so long, so it is very tempting to link that with the fact that the unemployment rate has been exceptionally high in recent years. As this paper points out, however, I may have missed the more important impact of extended unemployment benefits. Extended unemployment benefits keep worker's salary expectations high, and that has the effect of reducing employers' willingness to hire. It's not that unemployed individuals are insufficiently motivated to find work, it's that employers are insufficiently motivated to seek out more workers since salary expectations remain high. ... our estimates imply that most of the persistent increase in unemployment during the Great Recession can be accounted for by the unprecedented extensions of unemployment benefit eligibility. 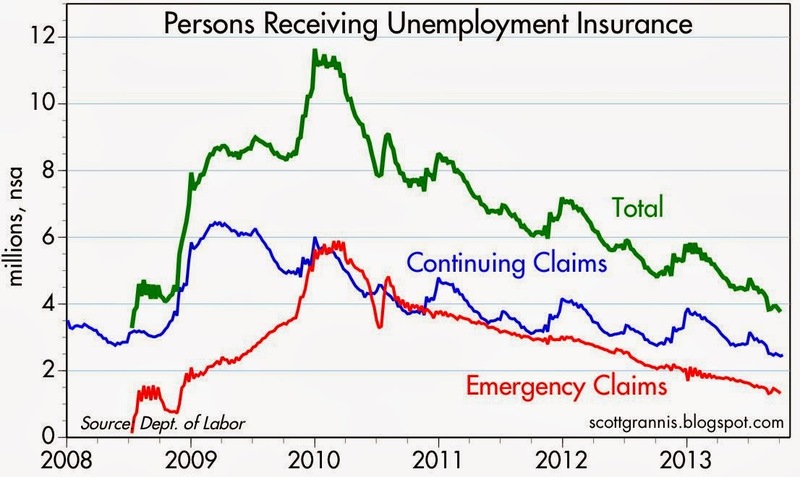 ... extending unemployment benefits exerts an upward pressure on the equilibrium wage. This lowers the profits employer receive from the filled jobs. As in equilibrium expected profits from filled jobs are driven down to the cost of vacancy posting, vacancy posting has to decline. Lower vacancies imply a lower job finding rate for workers, which leads to an increase in unemployment. In any case, the ongoing and significant decline in the number of people receiving unemployment benefits (down 21% in the past 12 months) is a good reason to remain optimistic about the economy's ability to expand total employment. 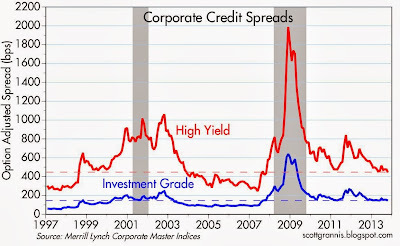 Corporate credit spreads are reliable and often leading indicators of the health of the economy. Currently they are trading at post-recession lows, which suggests that the fundamentals of the U.S. economy continue to improve, even though economic growth rates remain disappointingly slow. The chart above shows 5-yr Credit Default Swap Spreads, which are very liquid proxies for corporate credit spreads and default risk in general. Currently these are trading at post-recession lows, though they are still meaningfully higher than they were in early 2007. I take this to mean that the market is still somewhat concerned about the possibility of future economic setbacks, but for the time being the economic fundamentals look pretty good and are definitely not deteriorating. 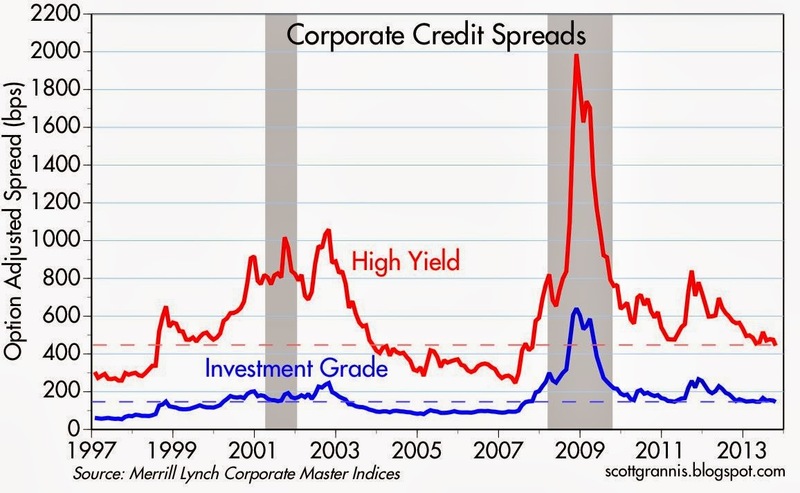 The above chart shows the average option-adjusted spread (arguably the best measure of default risk) on investment grade and high-yield corporate bonds. This too shows that spreads are at post-recession lows, but that they remain meaningfully higher than previous lows registered during times of relative economic tranquility. 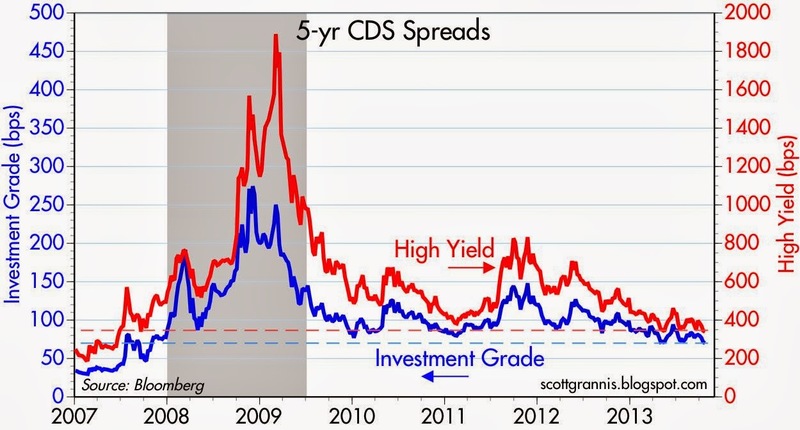 This confirms the message of CDS spreads: the market is still concerned about the future and somewhat risk-averse, but at the same time the market detects no deterioration in the economic fundamentals. From an investor's perspective, credit spreads are generally attractive, especially when compared to the almost zero yield on cash. 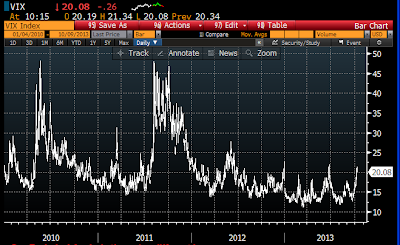 From a timing perspective, credit spreads give no indication of any impending deterioration in the outlook. 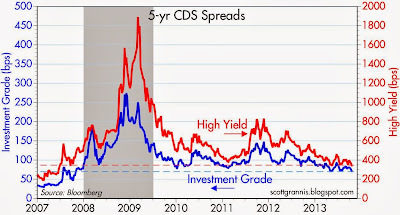 From a contrarian perspective, credit spreads suggest that valuations are reasonably, but not highly, attractive. In other words, the market realizes that economic fundamentals are reasonably solid, but nevertheless the market is not willing to pay relatively high prices for the right to earn extra yield. Purchasers of corporate bonds thus have a modest cushion against things going wrong, but this cushion is an order of magnitude less than it was in late 2008, when markets were priced to something like the end of the world as we know it. So: a word of caution to corporate bond investors, since risk premiums are still moderately attractive but on the margin much less so; and a word of encouragement to those who believe that the economic fundamentals support further gains in equity prices. Today Apple announced a very impressive array of new software and hardware. Apple's hardware products are now state-of-the-art across the board, with new and faster processors, retina displays, lighter weight, and refined design. 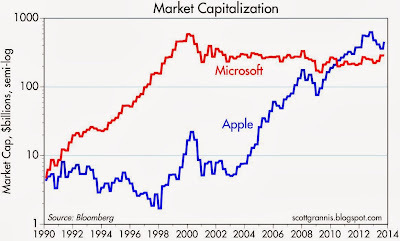 Apple now produces the best smartphones, tablets, laptops, desktops, and professional workstations in the world, at least in my humble opinion. At the same time, Apple has refreshed its entire software lineup, and taken the bold step of making all the new software free and accessible to just about everyone with an Apple device. Perhaps most impressive of all is the enhanced integration of all the new Apple products and Apple software. It's an ecosystem consisting of 1 million apps for iPhones and iPads, plus Apple productivity software—movie and photo editing, word processing and document creation, spreadsheets, presentations, and music creation, all working together via the cloud and across all devices—that no competitor can come even close to matching. We're still waiting for the Next Big Thing from Apple, whatever it may be, but in the meantime Apple has made giant strides on the software and hardware front. It's the breadth and depth of Apple's offerings, their quality and attention to detail, all combined with their virtually seamless integration, that is the true innovation that was on display today. 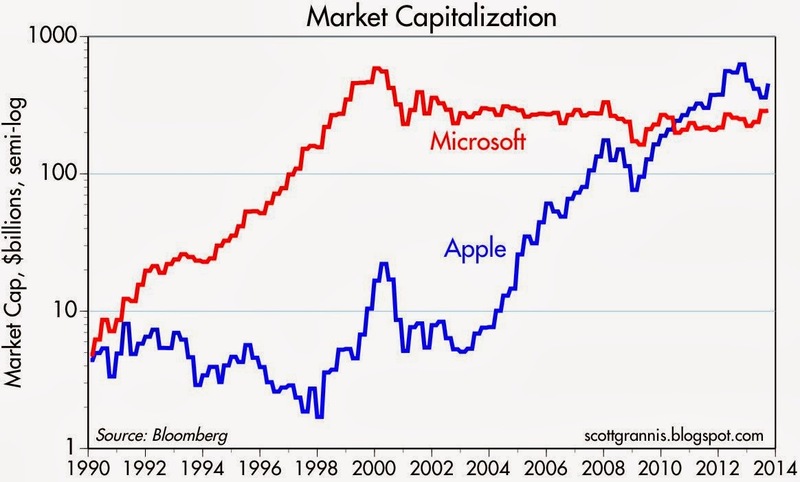 I just don't see the bearish case for this incredible company that is trading today with a PE of 13 (make that 10.5-11 if Apple were to repatriate its foreign profits and distribute the resulting after-tax cash). 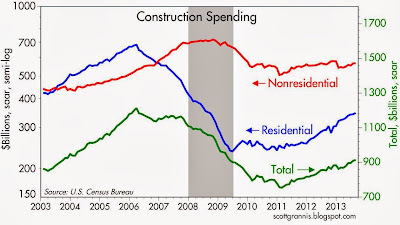 It's old news by now, but construction spending was up again in August. Residential construction spending gained 18% over the previous year, while nonresidential spending was up only 1.3%. 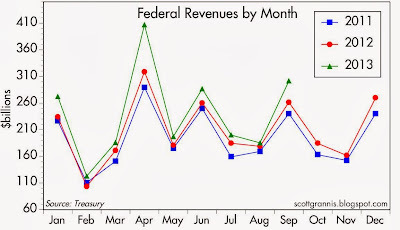 Total spending turned in a respectable gain of 7% in the 12 months ending August. After more than 5 years of wrenching retrenchment, the construction sector is now almost three years into its long-awaited recovery and once again contributing to overall economic growth. Sure, things could be better, but with time they most likely will be. Modest/moderate improvement is a lot better than no improvement at all. The headlines say that the September jobs report was weaker than expected, but the reality is that nothing much has changed: the economy continues to add jobs at a fairly unremarkable pace. The one notable feature of the report was a significant decline in part-time employment which invalidates the popular narrative which claims that the economy has only been adding part-time jobs this year. 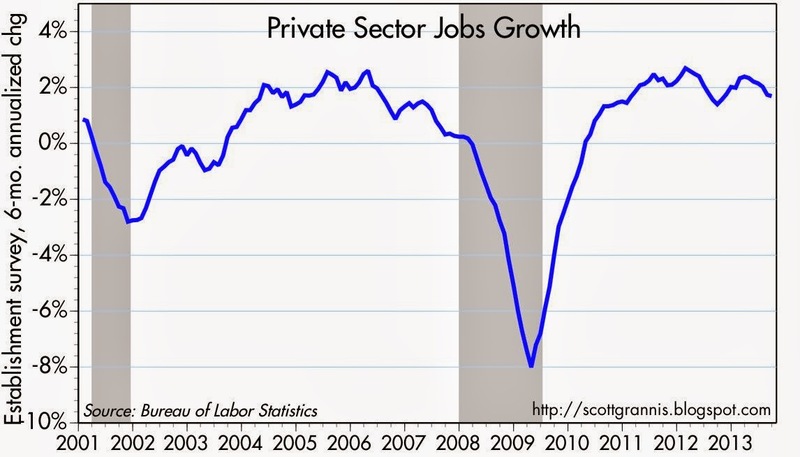 As the two charts above show, the gain in private sector jobs (+126K) was well within the range that we have seen in recent years and during the mid-2000s, even though it was weaker than expected (+180K). It's a disappointing number, but it's not a scary number, and nothing out of the ordinary. 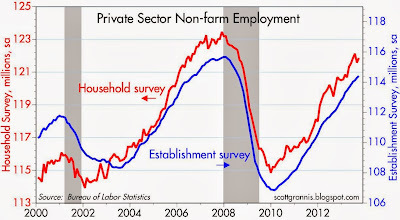 The chart above shows the level of private sector employment according to two survey methods. 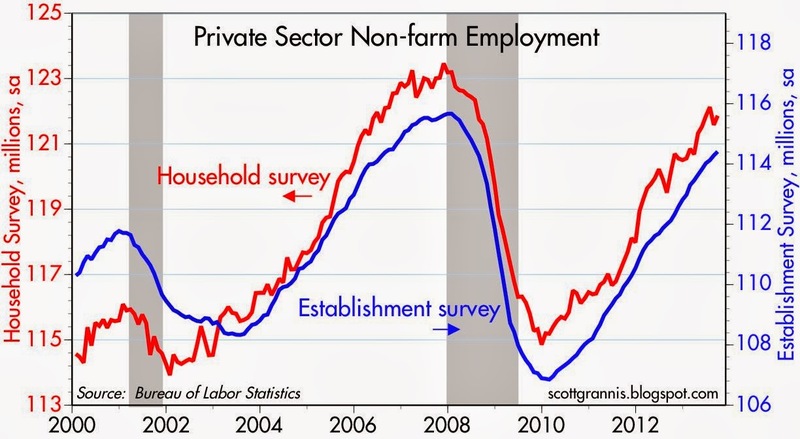 It's quite apparent that the economy continues to add jobs, and that it won't be long before the number of jobs reaches a new post-recession high. It's been an anemic recovery, but nonetheless definitely a recovery. 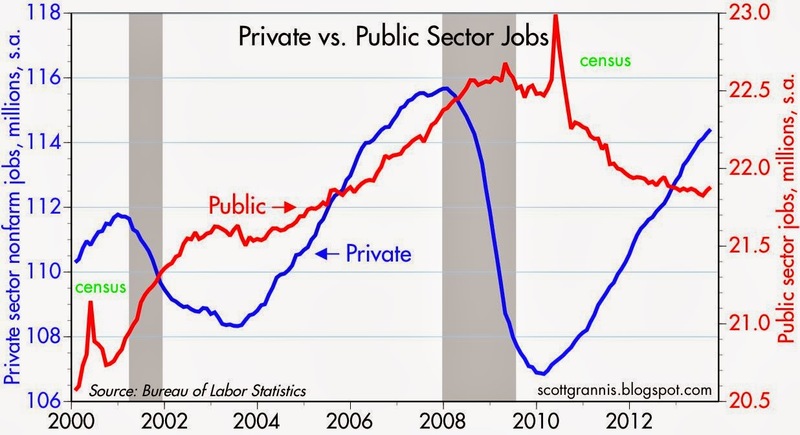 As the chart above shows, the unprecedented decline in public sector jobs has likely come to an end. 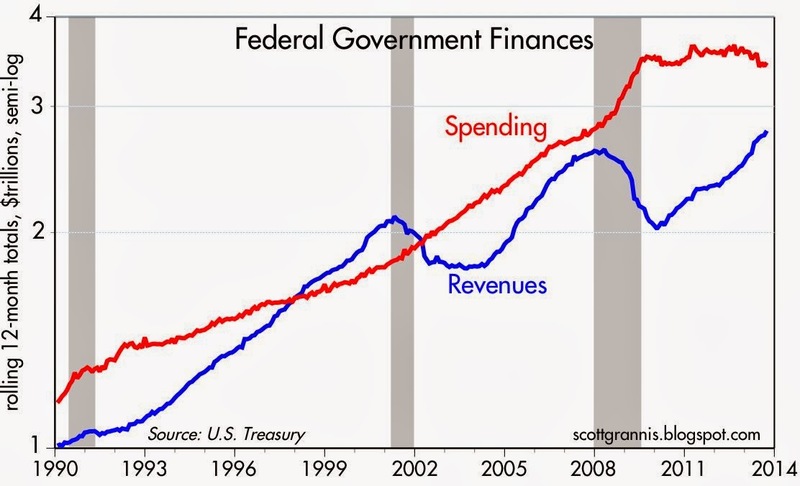 The economy has gotten rid of a significant amount of public sector bloat since the end of the last recession, and this bodes well for the future since it means the economy is fundamentally more efficient. According to the household survey, part-time employment dropped by 828K since its all-time high last July. As I noted here, the rise in part-time employment that we saw in the July report was most likely statistical noise, and today's report confirms that. 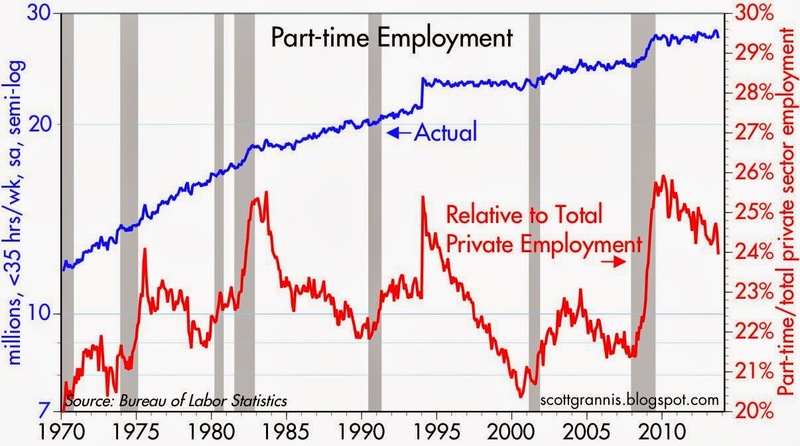 We now see that the number of part-time jobs hasn't changed much at all for the past four years. 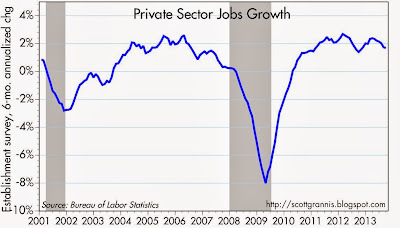 Relative to total private sector employment, part-time jobs have fallen to their lowest level since the recovery started. 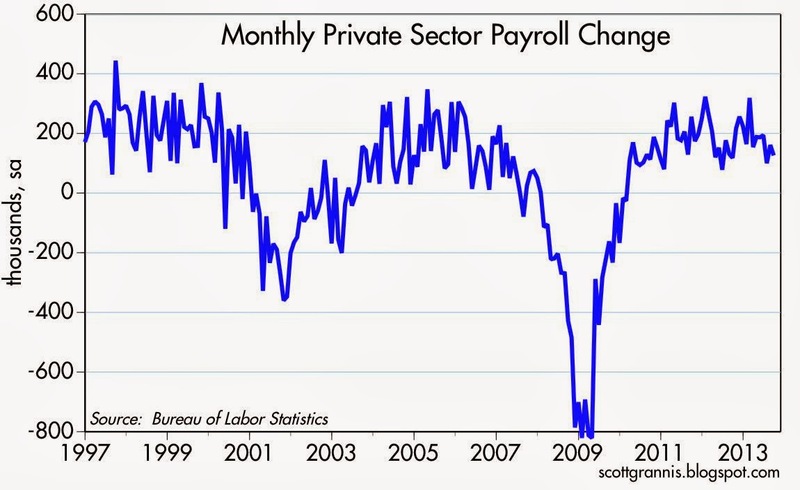 This recovery has seen relatively more part-time jobs than previous recoveries, but it's nothing extraordinary. Although the September employment gains were a bit disappointing, there is no reason to think that the labor market fundamentals have deteriorated. 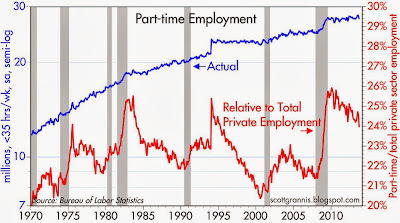 Indeed, the surge in part-time employment that we saw earlier this year now appears to have been a statistical mirage. 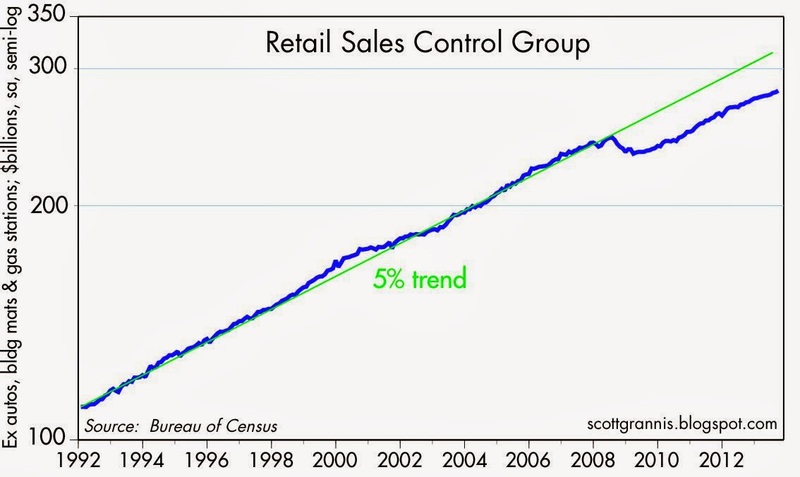 I don't see any new implications for Fed policy coming from this report. 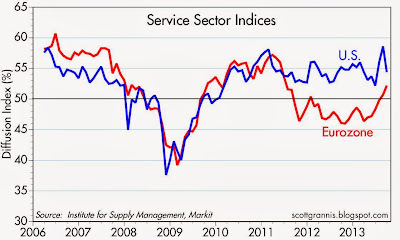 The economy is slowly but surely progressing, albeit in a disappointingly slow fashion. If anything, it's hard to find much justification here for the Fed to continue its extraordinary Quantitative Easing policy. 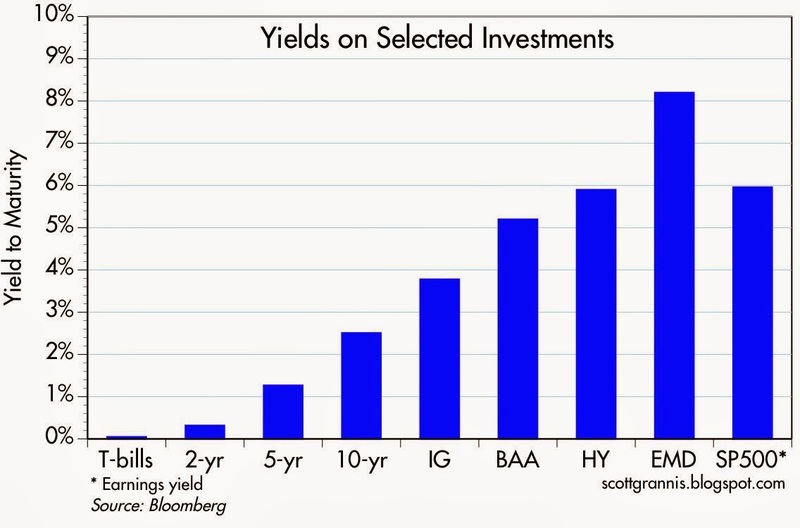 QE doesn't create jobs, it mainly satisfies the world's demand for risk-free assets. 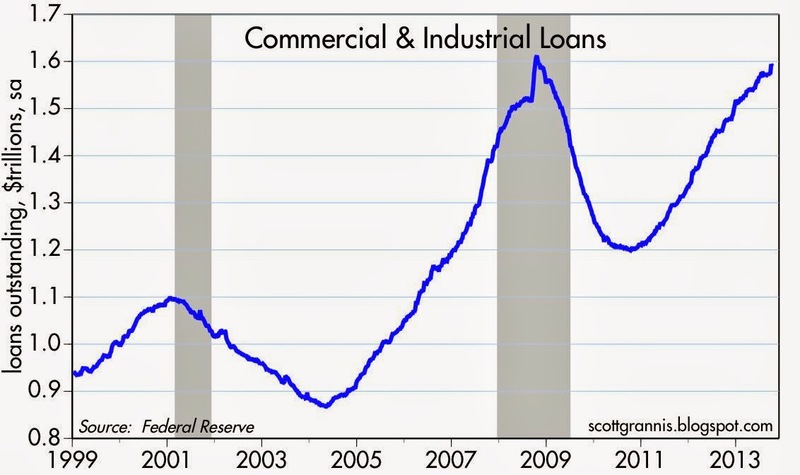 Outstanding Commercial & Industrial Loans (a proxy for bank lending to small and medium-sized businesses) have been increasing steadily for the past three years, and are now only a few billion shy of their pre-recession high. This likely reflects increasing confidence on the part of banks and businesses, and as such it points to continued economic growth. Banks continue to expand their lending activities to business, although the rate of increase in business lending (see second chart above) has slowed down a bit over the past year. It's true that banks are lending far less than the Fed's super-abundant provision of bank reserves would normally allow. Thanks to the Fed's Quantitative Easing programs, bank reserves have increased almost $2.3 trillion in the past five years. Theoretically, this would have allowed bank lending to increase by about 10 times as much, or $23 trillion. But that hasn't happened, mainly because a) banks are not willing to increase their lending willy-nilly, and b) businesses are not willing to borrow excessively. In short, the Fed's QE efforts have failed to result in an explosion of new money because the private sector remains quite risk-averse. 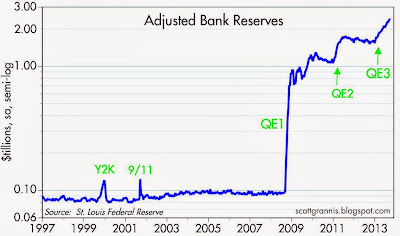 In fact, as I have argued many times over the past several years, the Fed's QE efforts have been primarily directed at satisfying a risk-averse world's craving for safe assets, rather than expanding the money supply. 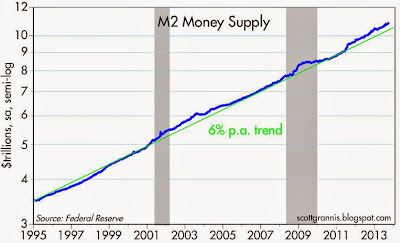 As the chart above shows, M2 (arguably the best measure of the U.S. money supply) has grown only slightly faster in recent years than its long-term average growth rate. Most of this above-average growth can be attributed to a significant increase in the demand for money. 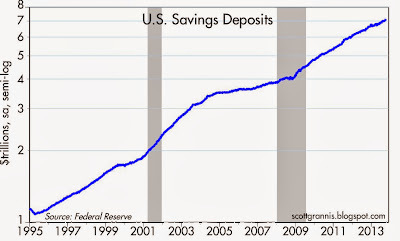 Today, 65% of M2 is held in the form of bank savings deposits (just over $7 trillion, up from $4 trillion at the end of 2008), with the remainder held in the form of currency (10.6%), checking accounts (12.8%), small time deposits (5%), and retail money market funds (6%). 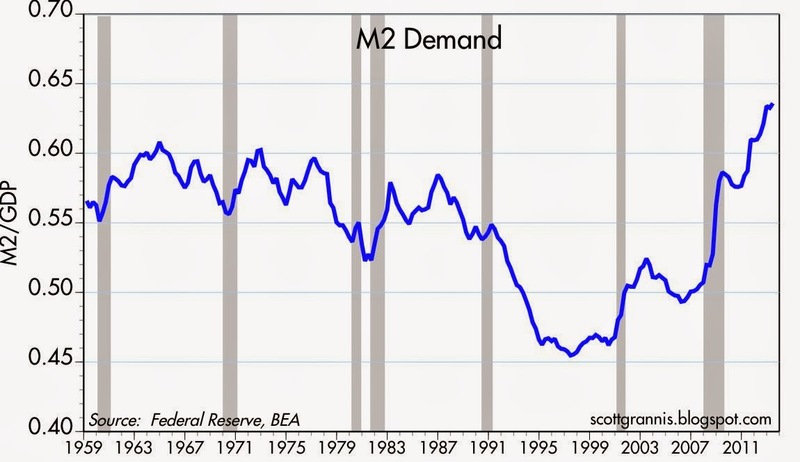 With savings accounts paying almost nothing in interest, it's reasonable to assume, therefore, that the vast majority of the increase in money supply has been demand-driven. It's not the interest rate on money balances that is attractive, it's the risk-free nature of bank savings deposits that is attractive. What's holding back the economy is not a shortage of money, it's a shortage of confidence. Bank lending by itself can't create growth, since growth only results from getting more output from a given amount of inputs. Bank lending can facilitate growth, of course, since many worthwhile enterprises might otherwise be unable to access the private debt markets. If confidence were higher and if banks and businesses were less risk-averse, we arguably might have a much stronger economy. 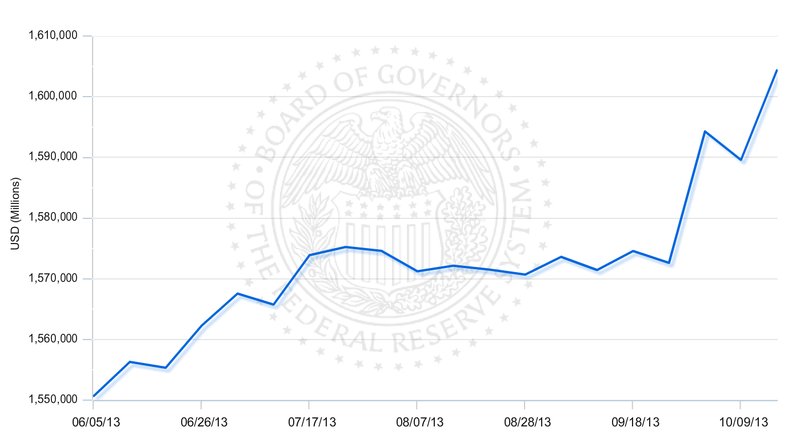 But at least the ongoing increase in bank lending is a step in the right direction. Confidence is slowly returning, and risk-aversion is slowly declining, and those are essential ingredients for a stronger economy in the years to come. 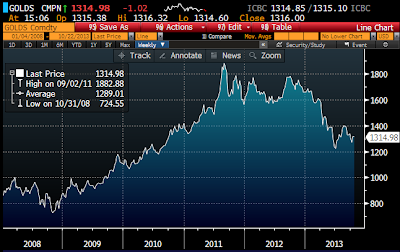 The decline in the price of gold (see chart above) is another way to see how risk-aversion is slowly declining. One more twist: Apple's new "spaceship" headquarters building, which yesterday was approved by the Cupertino City Council, will be almost as big as the Pentagon. 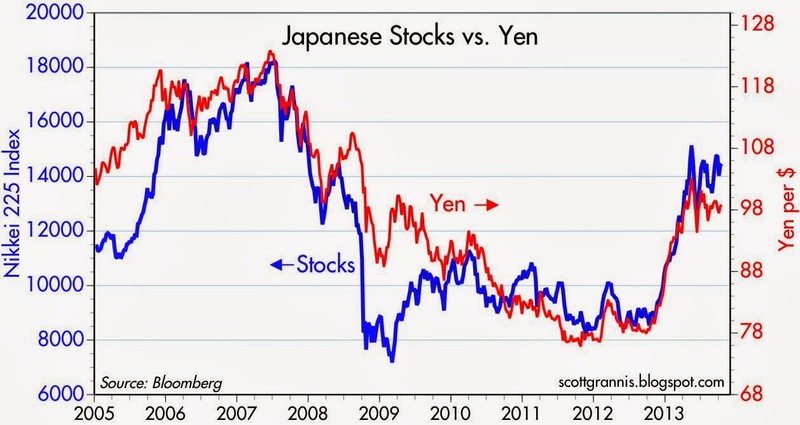 Last January I noted that "one of the biggest things happening on the margin is the decline of the Japanese yen." The Bank of Japan was effectively pressured into a serious relaxation of monetary policy. 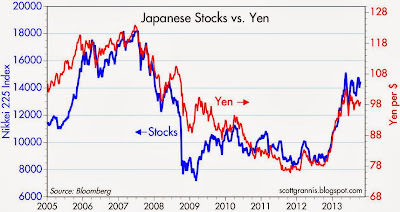 After being extremely tight for many years—as reflected in zero/negative inflation, a relentless appreciation of the yen against virtually all other currencies, a very weak stock market and a moribund economy—the Bank of Japan has completely reversed course. This has had predictable and impressive results. 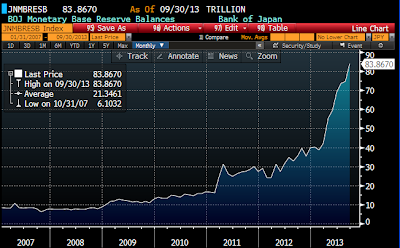 The above chart shows just how impressive the increase in Japan's bank reserves has been. 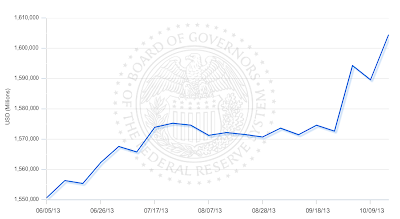 Reserves are up 137% in the year ending September. A genuine easing of monetary policy ought to result in a weaker currency, and that is exactly what has happened in Japan. 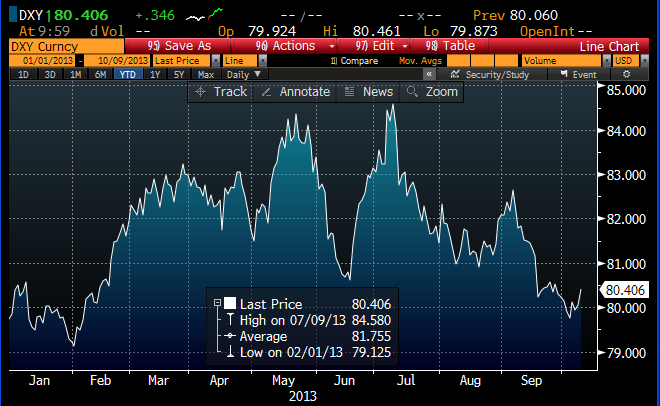 The yen has gone from 78 to 99 vs. the dollar in the past year, a decline of more than 20%. 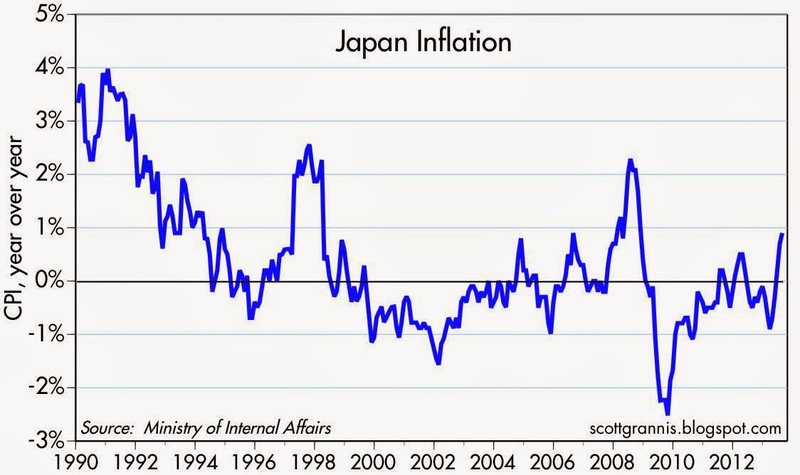 And to the extent that Japan's weak economy in recent years was the result of deflationary monetary policy, then easier money and a weaker yen ought to result in a stronger equity market. 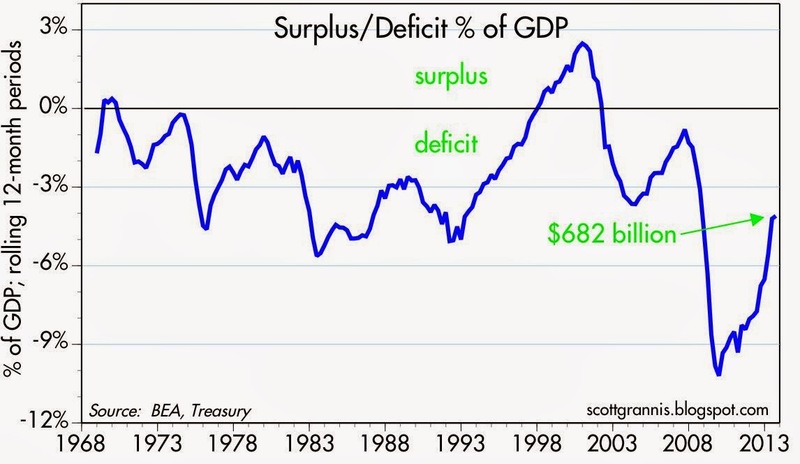 And indeed, as the chart above shows, that is exactly what has happened. 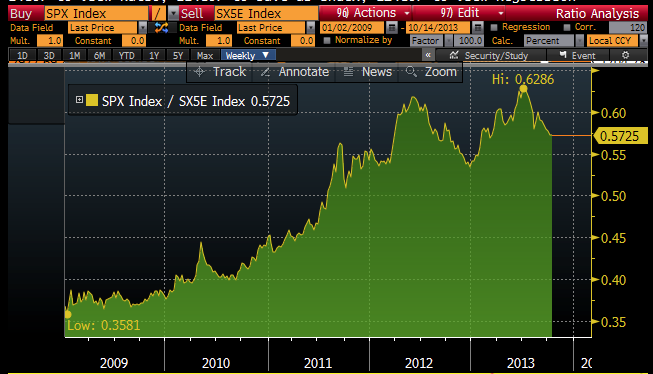 Japanese stocks are up over 60% in the past year in yen terms, and up 33% in dollar terms. Japan has apparently succeeded in reflating its deflated economy, and that is a good thing. 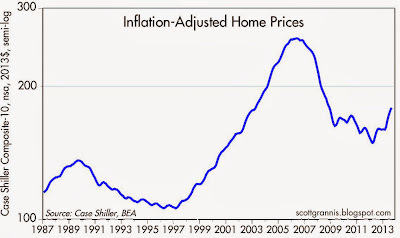 Inflation typically responds to changes in monetary policy with a lag, and that is exactly what is happening. As the chart above shows, Japan is now registering inflation of almost 1% in the past year, and it's likely to increase further over the next year. As inflation expectations increase, the desire of the Japanese to hold on to lots of yen declines, and the velocity of money increases, and that fuels faster nominal GDP growth. It's already apparent: inflation has accelerated (albeit only modestly so far), and in the first half of this year, Japan's annualized real GDP growth was almost 4%. Japan's monetary policy has done a good job. Going forward, the key to real success will be Japan's commitment to genuine fiscal stimulus (e.g., limiting the growth of public sector spending, reducing regulatory burdens, and reducing tax burdens). Prime Minister Abe seems to understand this, but of course the proof will be in the pudding. 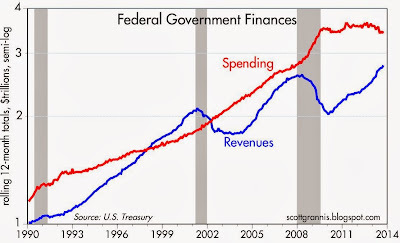 The chart above is worth a thousand words, at least, but here's a quick summary. Note 1) the strong correlation between equity prices in the U.S. and in the Eurozone over the past two decades; 2) the huge degree (over 50%) by which U.S. equities have outperformed their Eurozone counterparts since 2009; and 3) the fact that Eurozone equities are still 46% below their 2000 highs, whereas U.S. equities are 10% above their 2000 highs. In short, the Eurozone economy has followed pretty closely the direction of the U.S. economy, but in the process has fallen way behind. The above chart is the ratio of the S&P 500 index to the Euro Stoxx index. 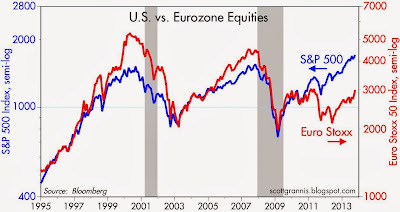 The U.S. equity market clearly led the Eurozone by leaps and bounds from 2009 through mid-2012, with much of the "credit" likely going to the PIIGS sovereign debt crisis. But for the past year or so the Eurozone appears to be holding its own and even pulling ahead, as reflected in the declining ratio. 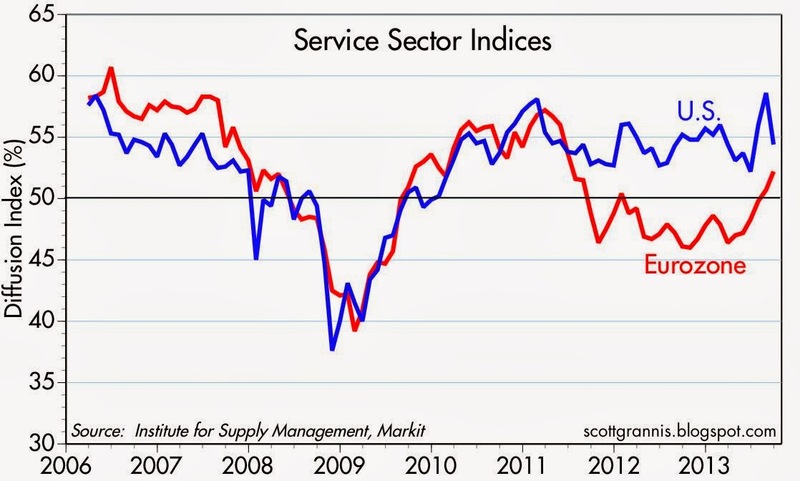 The relative improvement in the Eurozone economy has been showing up for most of the past year in the manufacturing and service sector purchasing manager surveys, as seen in the above charts. Europe suffered a two-year recession which has recently come to an end. Even though Eurozone growth still lags the U.S. significantly, the Eurozone is doing somewhat better on the margin, and better than expected. 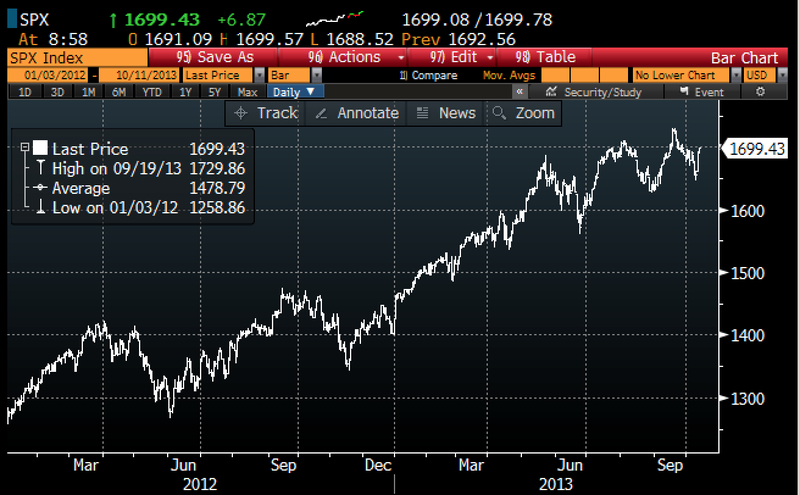 Caveat: I'm not predicting that Eurozone stocks will continue to outperform U.S. stocks, as they have recently. My main point is simply that it appears that the Eurozone is no longer the laggard that it has been for so many years. That's good news for Europe, and it's good news for the U.S. as well, since a stronger Europe bolsters the outlook for global growth, and that is good for almost everyone. 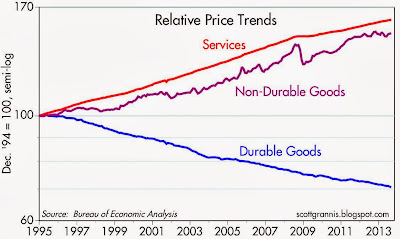 Since the end of 1994, the average price of durable goods has declined by almost 30%, while the price of services has increased by 60% and the price of non-durable goods has increased by 50%. 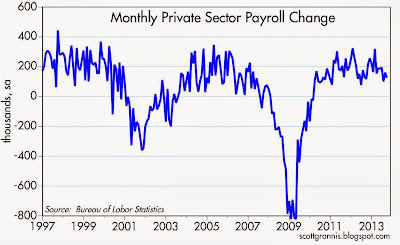 Over the same period, the average hourly earnings of private sector non farm workers has increased by 74%. 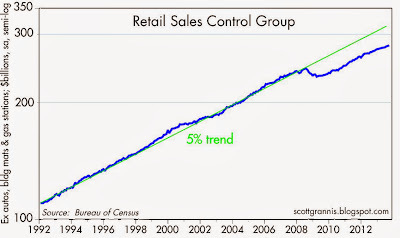 This means that the average worker only needs to work about 40% as much today in order to buy durable goods (e.g., computers, cameras, cars, TVs) as he or she did 18 years ago. 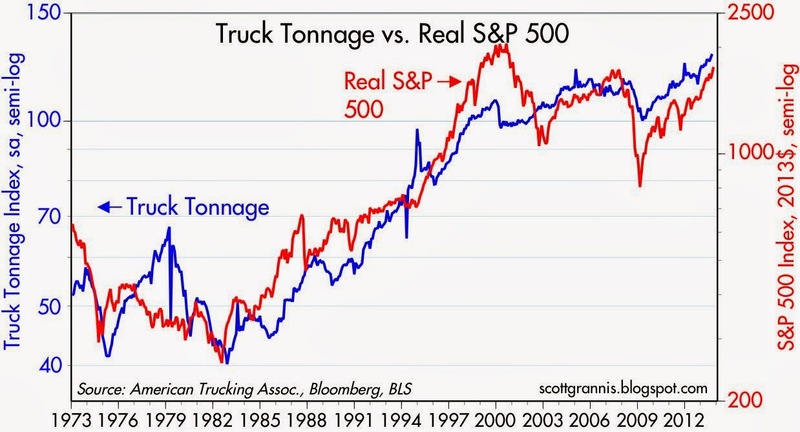 Put another way, one hour of work today buys about 2.5 times as much in the way of durable goods as it did in 1995. 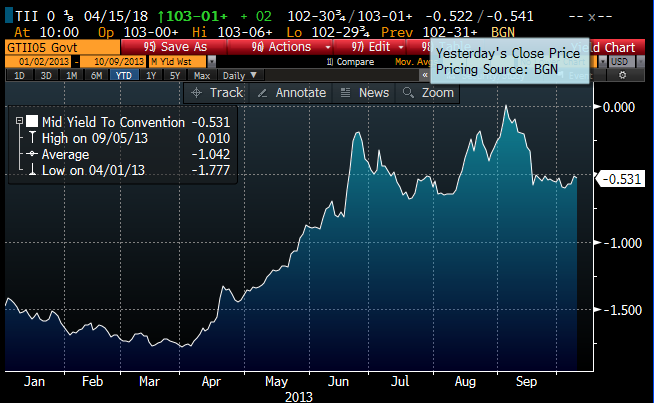 This kind of deflation is awesome. 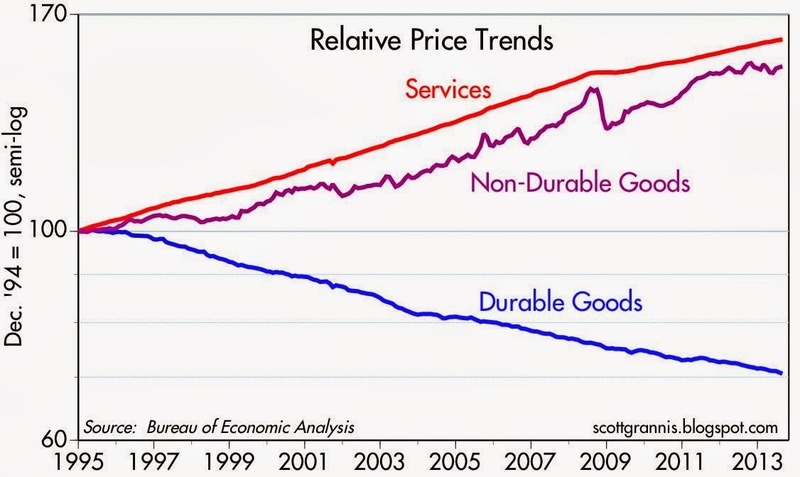 Thanks to durable goods deflation, as Mark notes, "the standard of living for most households has actually increased significantly over the last 20 years, when measured in what is ultimately most important: household consumption and the affordability of life’s basics." Sometimes you have to take the advice of the "experts" with a grain or two of salt. Case in point: Mark Zandi, in written testimony today to the Joint Economic Committee: "equities ... have been slowly grinding lower since mid-September." Zandi, a reliable source for quotes that reaffirm Keynesian economic logic and avoid ruffling consensus feathers, is trying to make the case that Congress should end the shutdown and reverse the sequester in order to boost the economy. That without these actions, the stock market is telling us that the economy is doomed to deteriorate. I'd say a more accurate description of the equity market is just the opposite: equities have been grinding higher for the past four years or so, despite the many obstacles—like the shutdown and the sequester—that have been thrown in its path. 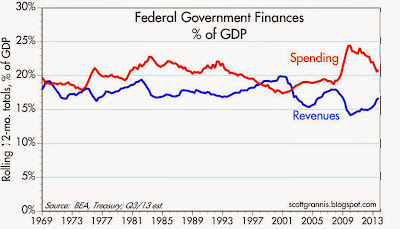 The economy has been slowly improving as well, despite a degree of "fiscal austerity" over the past four years that would have led any Keynesian to predict a recession. 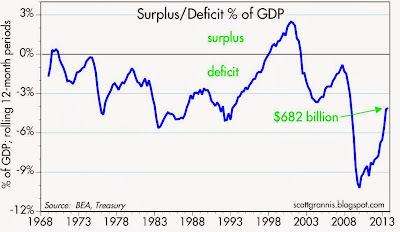 The economy's disappointingly slow growth, in my view, has almost nothing to do with fiscal austerity. Rather, it has to do with policies that are smothering the private sector: e.g., higher taxes, increased regulatory burdens, increased subsidies and transfer payments, and Obamacare. Reversing any or all of these policies would almost surely do more for the economy than reversing the sequester. 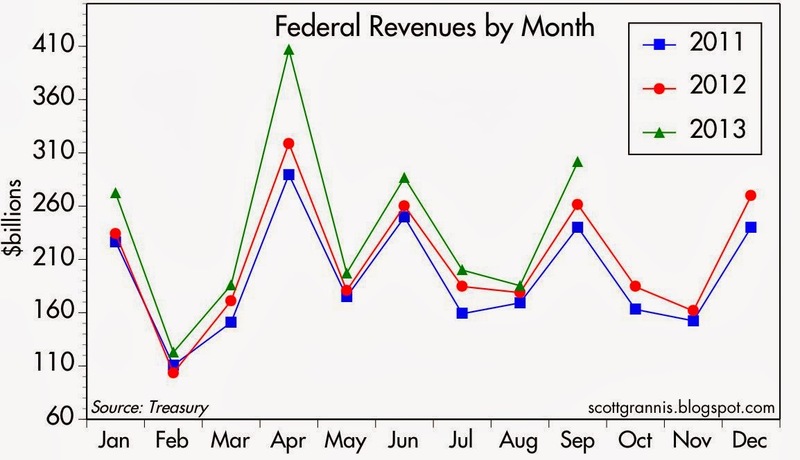 Last week I argued that the lack of government-provided statistics was not really a problem, since there are lots of real-time, market-based prices out there that speak volumes about the state of the economy. Here's an expanded list, with up-to-date charts, of the indicators I think are the most important to watch. 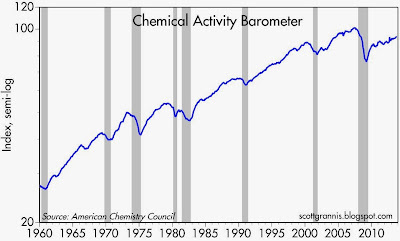 On balance, I don't detect anything going on that's particularly disturbing or encouraging, which means the economy is probably continuing to expand at a relatively slow pace. 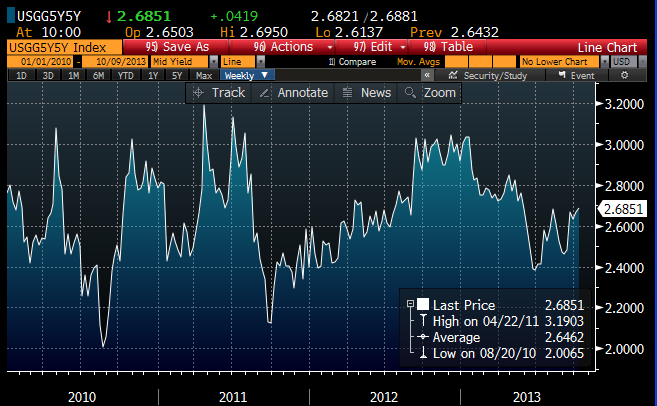 Yields on 1-mo. T-bills have jumped this month by about 25 bps, whereas yields on bills maturing in 3 and 6 months remain quite low. This reflects a modest degree of concern that the current government shutdown and debt ceiling debate may remain deadlocked and result in a temporary "default" on federal debt. If the risk of default were major and lasting, yields on all maturities would have spiked, but that is not the case, at least so far. This is akin to a tiny ripple on the pond of risk. 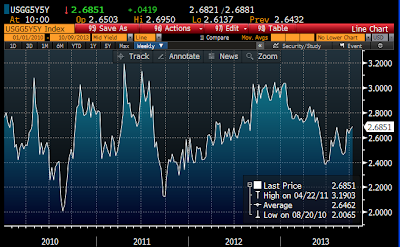 2-yr swap spreads are about the best leading indicator of systemic risk that I'm aware of. 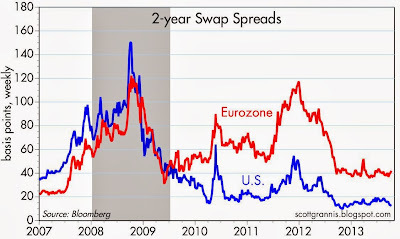 (For more detail on what swap spreads are, see here.) 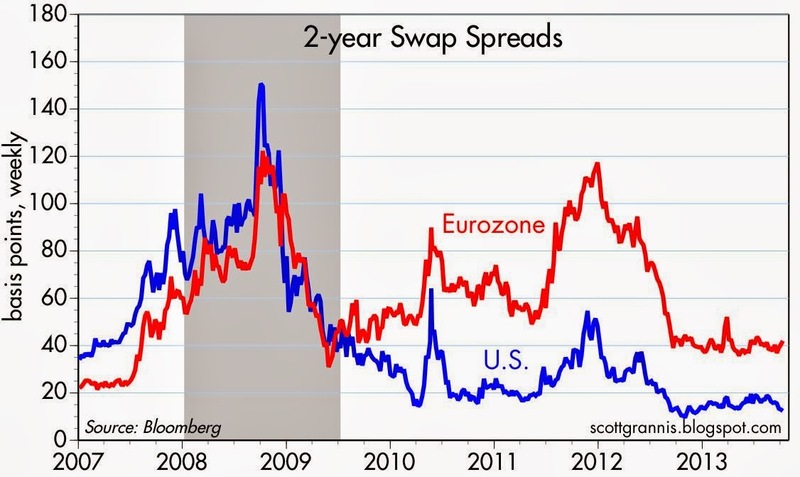 Today, swap spreads in the U.S. are about as low as they have ever been, while swap spreads in the Eurozone remain somewhat elevated. This reflects almost a complete absence of any degree of risk in the financial and economic fundamentals in the U.S., and a modest degree of risk in the Eurozone economy. 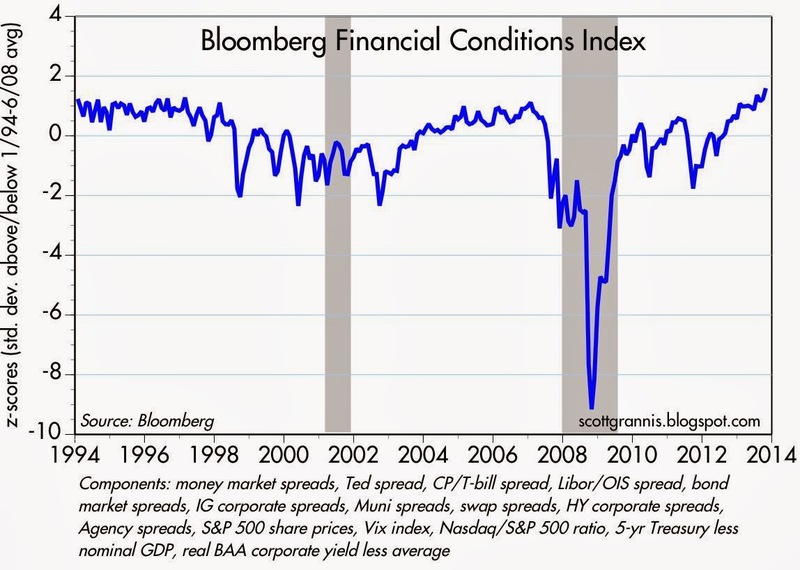 Conditions have not changed materially in the past year. 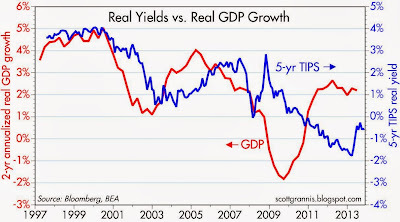 As the first of the above charts shows, real yields on TIPS tend to track the real growth of the U.S. economy. Real yields have moved substantially higher in the past six months, and that is a good indication that the market believes the economic fundamentals of the U.S. economy have improved. But real yields are still quite low, suggesting that the market now expects the U.S. economy to grow at a sub-par rate whereas before the market was concerned about the potential for a double-dip recession. As the second chart shows, real yields have dropped about 50 bps from their recent high, reflecting a) some disappointment with the economy and b) less likelihood of a near-term Fed tapering. Under the new leadership of Janet Yellen, the Fed is probably less likely to taper and less likely to tighten aggressively. 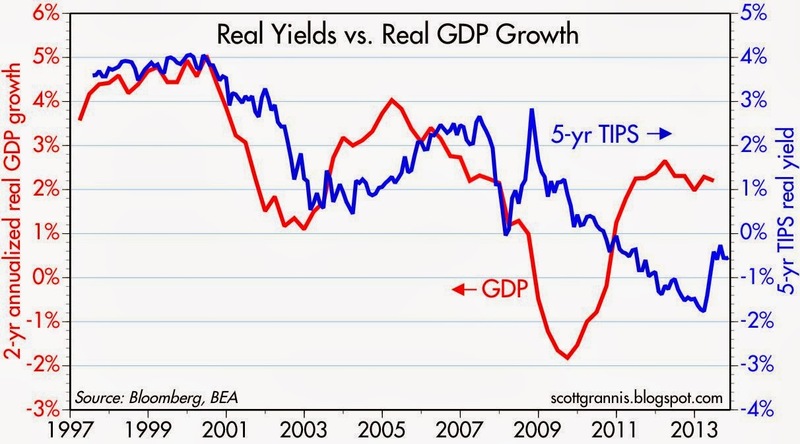 Real yields would have to decline further before I would worry that economic fundamentals were deterioriating. The above chart shows the market's implied inflation expectations for the 5-year period beginning in 5 years, which are derived from the yields of 5- and 10-yr TIPS and Treasuries. 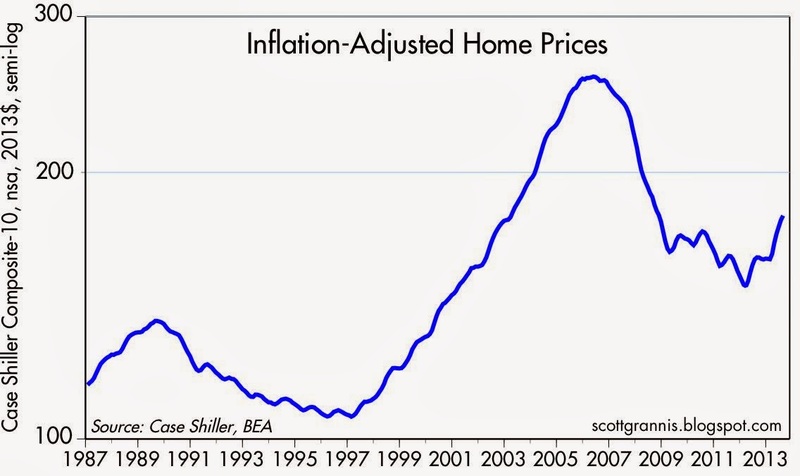 This is the Fed's preferred measure of forward-looking inflation. 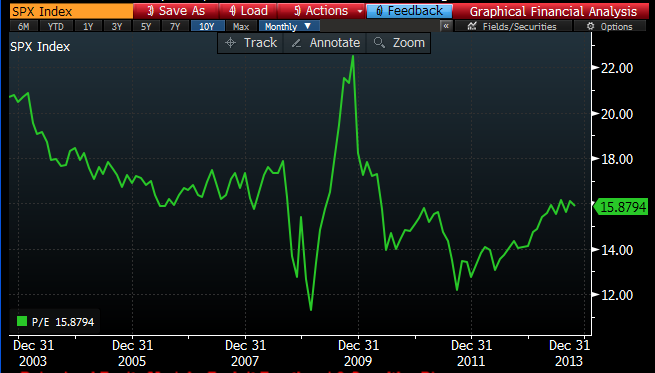 As the chart shows, inflation expectations today are almost exactly the same as the average of the past four years. 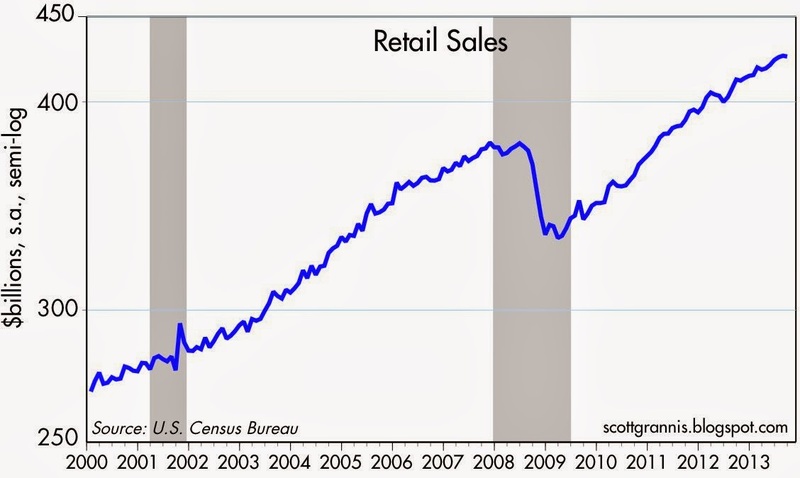 Nothing much going on here—inflation is likely to remain subdued for the foreseeable future. The price of gold has been remarkably well correlated with the inverse of 5-yr TIPS yields (which is equivalent to saying that gold has been positively correlated with TIPS prices). I've argued that this is a sign that the world's demand for safe assets is beginning to decline. Not much has changed here in the past month or so, but this remains one of the more intriguing relationships I follow, especially since the demand for money and safe assets has been extraordinarily strong for the past 5 years. 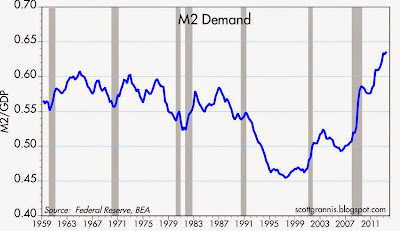 Strong money demand has led to a major decline in the velocity of M2, and has all but compelled the Fed to adopt its Quantitative Easing policy. As I've argued before, the primary function of QE is not to "print money," but to swap newly created bank reserves (functionally equivalent to T-bills) for bonds. 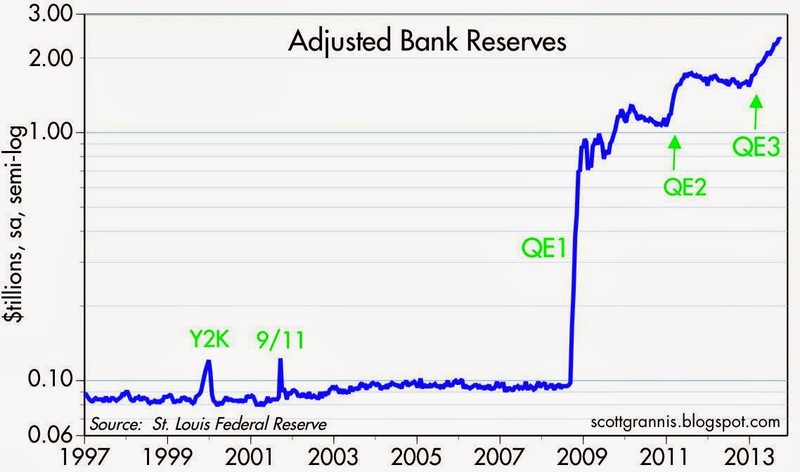 Since there is no evidence of any increase in inflation as a result of the Fed's QE efforts, we can infer that the Fed's provision of bank reserves was likely just enough to satisfy the world's demand for safe assets. 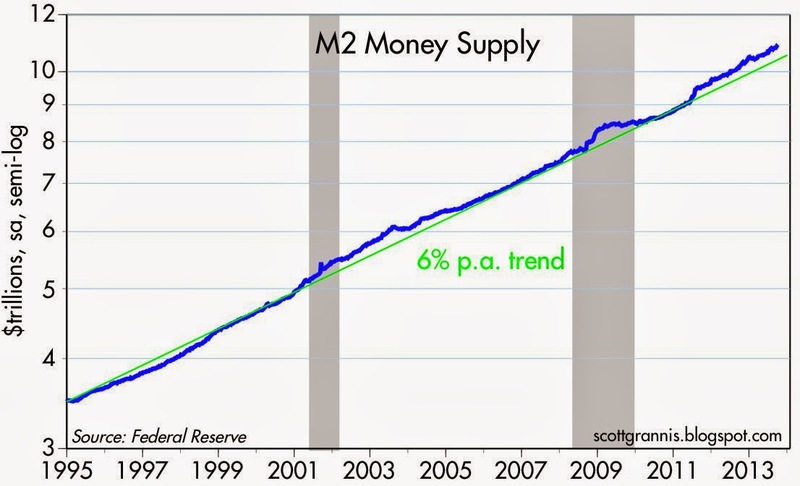 When the supply of money equals the demand for money, there are no inflationary consequences. 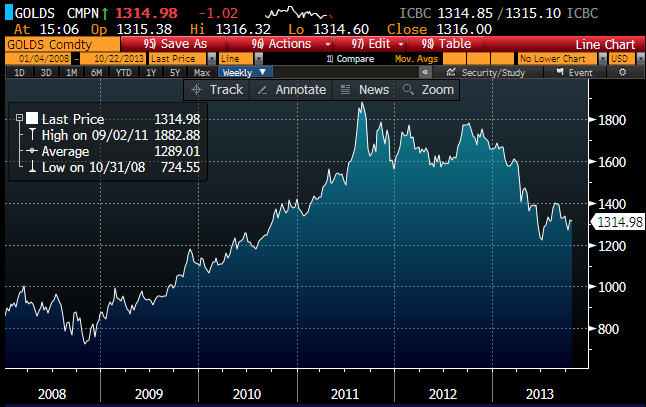 Gold and industrial commodity prices have tended to move together over long periods. The most striking thing in the chart above, in my opinion, is the degree to which gold "overshot" the rise in commodity prices coming out of the Great Recession. I think this reflected very strong demand for safe assets, very deep concerns over the potential for QE to be inflationary, very deep concerns about the long-term value of the dollar, and deep-seated concerns about global financial stability. 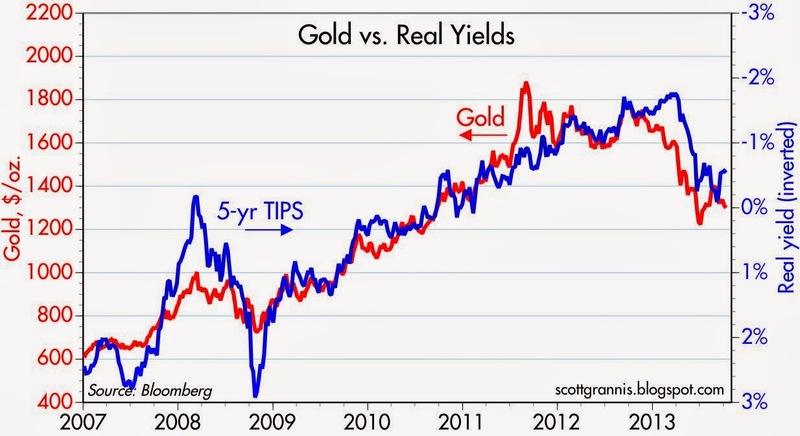 But since these fears have not been realized, gold has begun to fall back in line with commodity prices, which have been relatively stable for the past few years. Not much has happened to gold in recent months, but if the world continues to avoid a disaster then I would expect gold prices to move lower. 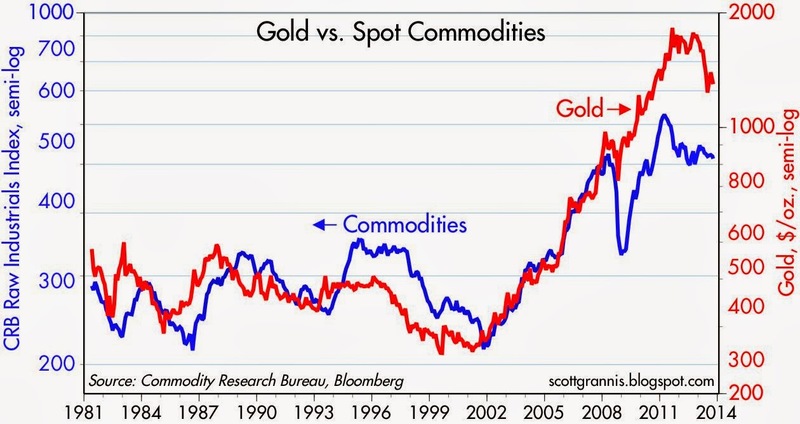 Relatively stable commodity prices tell me that there are no material changes in the strength of the global economy. 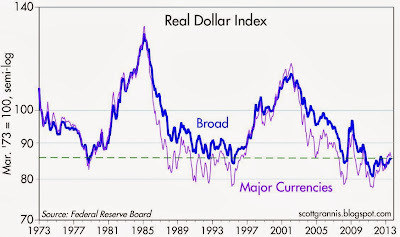 As the first of the two charts above shows, the inflation-adjusted value of the dollar relative to a trade weighted basket of currencies is still unusually weak. However, the dollar has managed to increase somewhat in the past two years, which I take as a sign that the U.S. economy has done somewhat better than expected (or perhaps it's better to say "not as badly as expected"). The second chart looks at the nominal value of the dollar vs. major currencies for the year to date, and here we see that the dollar has only recently found a bit of support after declining from last summer's highs. There's not much love out there for the dollar, but neither is the dollar disastrously weak. On the bright side, there's a lot of room for improvement in the dollar if the outlook for the U.S. economy were to improve. 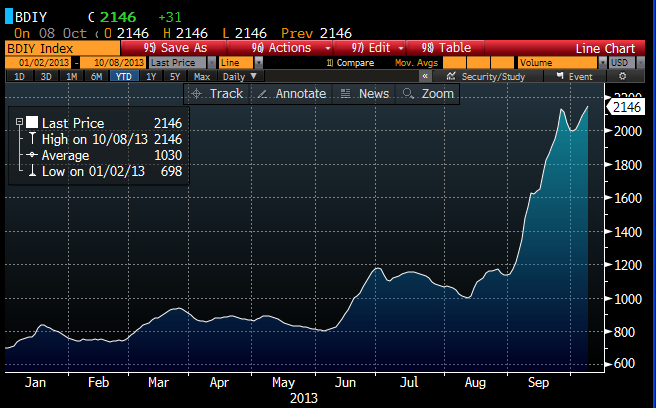 This measure of shipping costs for bulk commodities has staged a remarkable comeback in the past four months. 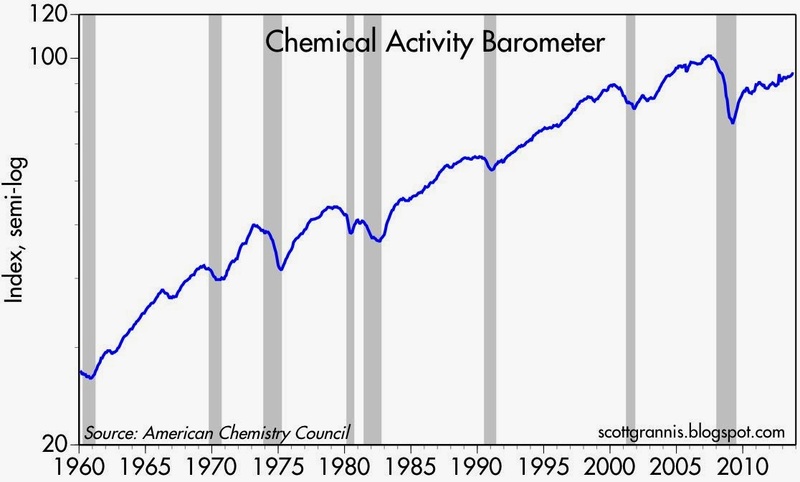 While it's difficult to draw firm conclusions from this (the index can be affected not only by demand for commodities but by changes in available shipping capacity), I think it's safe to say that global economic activity is not deteriorating, and may even be firming. 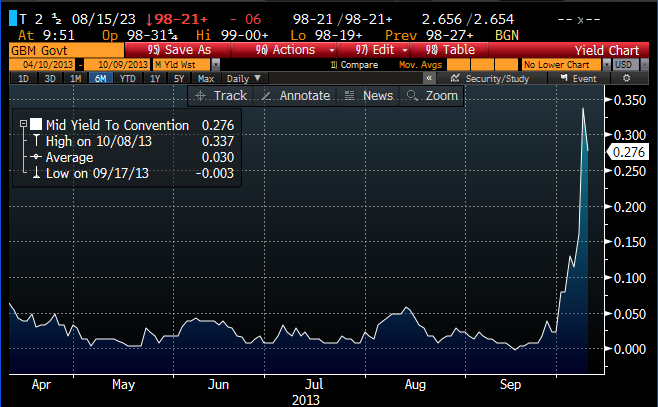 CDS spreads are a very liquid proxy for the default risk of corporate bonds. That spreads are still very close to their lowest levels since the recession is a sign that the market detects no deterioration in the economic outlook. Spreads are still meaningfully higher than their pre-recession lows, however, which signals that the market is still relatively risk averse. 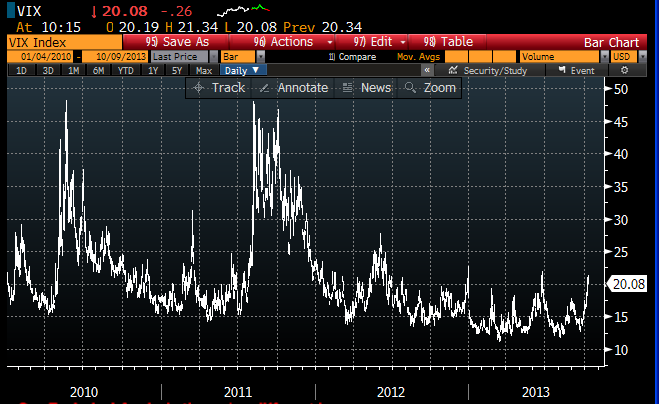 The Vix index has jumped of late, a clear sign of increased market jitters. But from a longer-term perspective, it is still relatively low. The market is obviously concerned about the ramifications of the current government shutdown, but not terribly so. 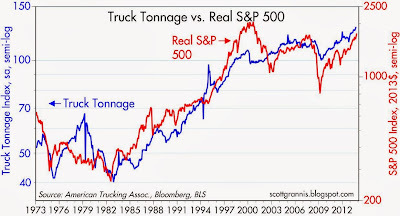 This is a contributing factor to the general mood of risk aversion that pervades most market indicators. 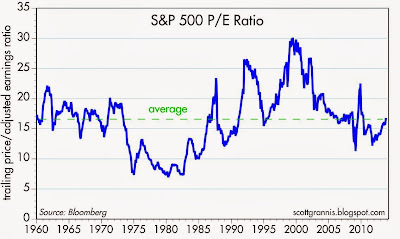 The first of the above two charts shows the PE ratio of the S&P 500 index. It's up from the lows of 2010, but is not unusually high. 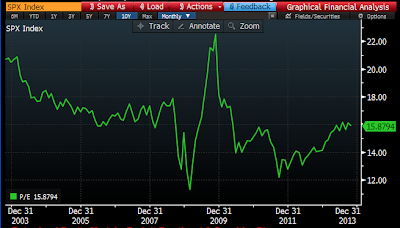 In fact, PE multiples today are almost exactly in line with long-term averages. 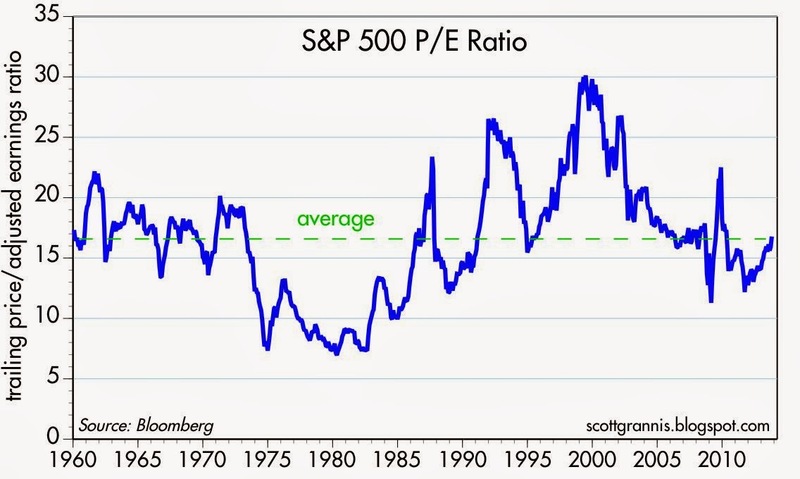 I think this shows that the market is at the very least not overvalued. Indeed, since corporate profits currently are at record levels in both nominal terms and relative to GDP, I think this shows a remarkable lack of optimism. In other words, I take this as a sign that the market is still relatively risk averse, and that explains why the demand for safe assets is still relatively strong. 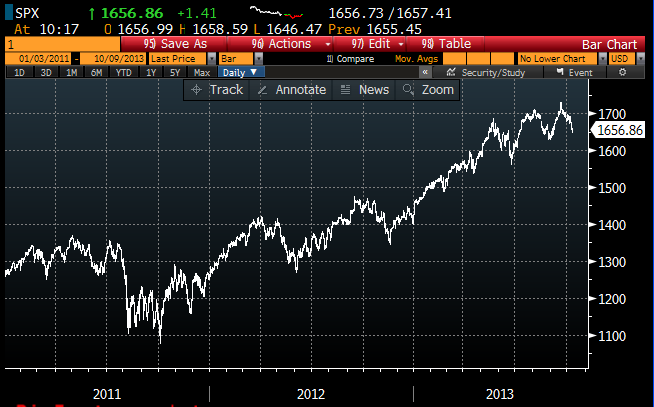 The second chart shows the index itself, which has been on an uptrend ever since March, 2009. 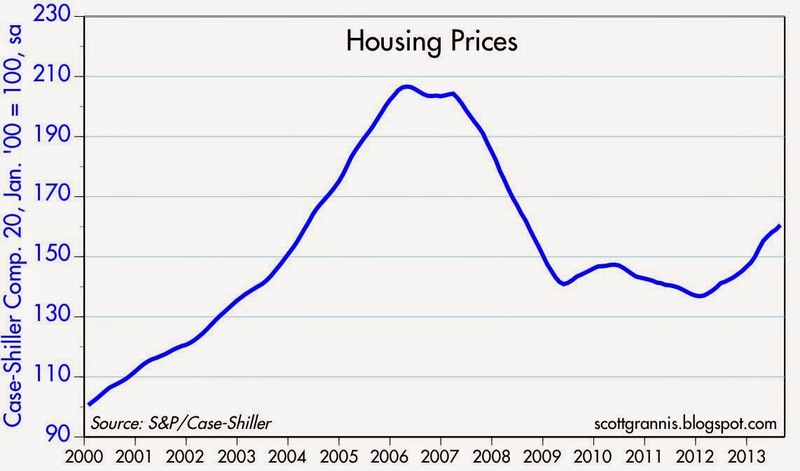 Prices are near all-time highs, but valuations are still relatively subdued. There is still lots of upside potential if the market should start to feel less concerned about monetary and fiscal policy, and/or should the economic fundamentals improve.